Dear Lord, that was ugly. There was a time when Michigan was good at holding onto the ball. That time is not now. Last night's suckfest agaisnt Indiana featured 33 turnovers in 40 minutes of basketball--15 by Michigan and 18 by Indiana. To go along with that, Indiana shot 1-15 (!!!) from three point range and Michigan shot 4-18 from outside. The teams combined to go 43-104 (41.3%) with an eFG% of 43.75%. What a truly abysmal game to watch. And yet somehow, Michigan walked away with a 24-point win and scored 69 points. Sheesh. OK, so that's out of the way. What's the good news? None, really. Matt Vogrich turned in some good minutes and went 1-2 from three point range. Unfortunately, when he wasn't doing that, he was clogging up the weakside of the offense and looking mostly lost. I'm glad he got minutes in this game, but he's clearly not ready for the prime time yet. Also, Anthony Wright played eight minutes and only did one bad thing. Improvement! The rest of the game is your common refrain: Only Harris and Sims can score (and for much of the game, only Sims could score), the team can't shoot from outside, no depth, etc. etc. etc. Michigan did manage to get a lot of calls in the first half and found themselves cashing in from the charity stripe to the tune of double-digit points. That was encouraging. At least the team's free throw shooting looks to be back on track after the terrible start. And fortunately, I didn't have to break anything yesterday. Beilein didn't once use the 2-3 zone, likely because of how poor it's been for the team this year, but he also didn't really use the 1-3-1, which is starting to worry me a little bit. IICR, they used the 1-3-1 on only one possession early in the game. It produced a good three point look for Indiana--that ended up being their only three point basket of the game--and Beilein never went back to it. It's not necessarily that Michigan can't guard man-to-man, but Beilein refusing to give different looks on defense just furthers my point that he's been mostly absent in games. Toward the end of the blowout, why didn't Michigan get a little more practice in the 1-3-1 if they're struggling with it? I just don't get it. 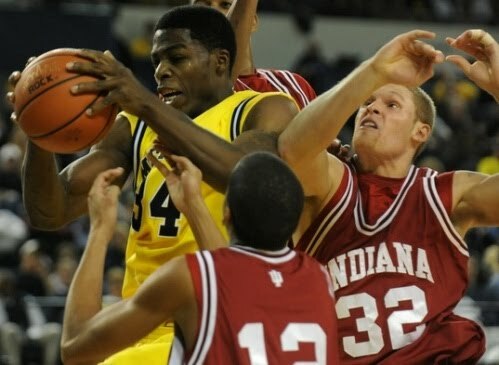 One thing that did happen yesterday that impressed me, however, was Beilein sitting Manny Harris. I've said it before and will no doubt say it again this season: This Michigan offense runs a lot better without Manny Harris. That's not to say they're a better team without him (they aren't), but the offense looks smoother, faster, and more cohesive with Harris on the bench. When Harris came back into the game, he looked like a different player and he started hitting shots. The offense was still a little too Manny-centric for my taste, but you can't argue with the production. And finally: Holy crap, DeShawn Sims might've played his way into a first-round draft pick in the last three weeks. His shot has never looked smoother. He's stronger when getting to the bucket. His touch is unbelieveable. Passing and shot blocking are both significantly better than last year. I'm sold: Sims is going to be a legitimate NBA small forward once he can add a little bulk--it's a shame he's playing so terribly out of position on this team, but he's making the most of it and looks fantastic.